BACK BY POPULAR DEMAND...THE GOLF PLAYERS BUNDLE! Give the gift of golf this holiday season, or buy one (or two!) for yourself. Don't miss out on this great deal, the Golf Players Bundle! Receive ten 18 hole rounds of golf including cart, full use of practice facilities day of play and 15% off at the Overlook Restaurant on day of play for $450 +tax. The Players Bundle is valid Monday-Thursday anytime and Friday-Sunday and Holidays after 11am. Booking window of 7 days in advance for tee times. Golf rounds are transferable, which makes them the perfect gift! The Players Bundle golf rounds are valid for use December 1, 2018-April 30, 2019. Buy an additional bundle at the same time and receive 10% off of your second one! 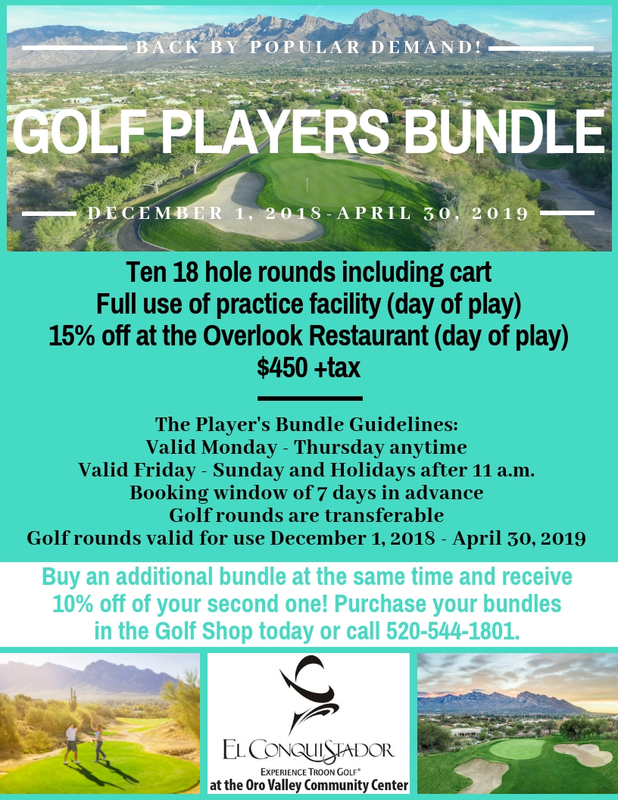 Purchase your bundles in the Golf Shop or call 520-544-1801.